During Mental Health Awareness month this October, electronic music website Rave Reviewz is launching Music on my Mind – a music and mental health campaign with the aim of raising funds for mental health charities and awareness of mental health issues in the public AND music community. Around 45 percent of people in Australia will experience a mental health condition in their lifetime. In any one year, approximately 1 million Australian adults have depression, and over 2 million have anxiety. Rates are even higher in musicians, who are almost seven times as likely to have thought about suicide in the past 12 months in comparison to the general public and are more than twice as likely to attempt to take their own lives. Rave Reviewz founder Dr Kamran Ahmed is a psychiatrist who became aware of the high rates of mental health problems in musicians when he launched their website and began working in the music industry, so we often ask about mental health when we interview DJs but decided that we should do more. 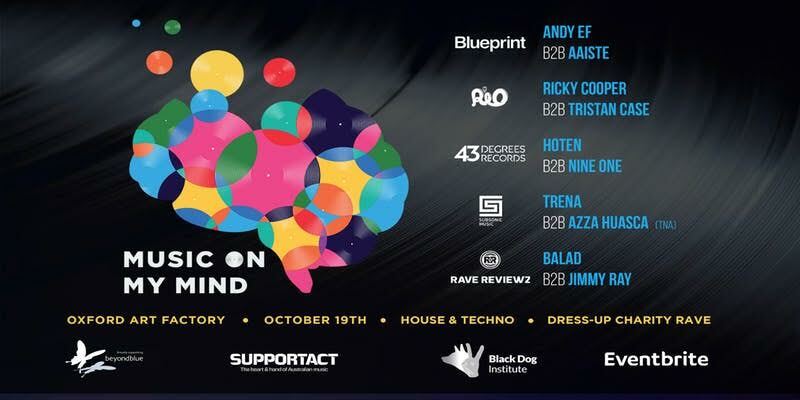 This October, with the support of over 50 electronic music event companies we’ll be raising funds for three mental health charities supporting the public and music community specifically; Support Act, beyondblue and Black Dog Institute through an online appeal and a dress-up rave featuring some of Sydney’s best house & techno DJs at Oxford Art Factory on Friday 19th October. We hope to see you there! We’ll also be raising awareness of issues related to mental health and music and tackling the stigma that surrounds mental health problems through our Facebook page. For more information on Music on my Mind visit www.musiconmymind.com.au. We would love your support with this important cause, so please feel free to circulate through your networks, attend the charity rave and make a donation.